A visitor looks at BYD E6 electric car on display at the New Energy Auto Expo in Nanjing, Jiangsu province March 22, 2014. Thr... in January demonstrated the importance of green cars by visiting a factory of BYD Co Ltd , maker of the e6 pure electric car. Fortunately for Beijing, a team of American and Chinese researchers has undertaken a study in the Stanford Social Innovation Review that offers some guidance as to what in the current Chinese strategy is working and what is not. What is working? Of the five initial pilot cities—Beijing, Shanghai, Shenzhen, Hangzhou, and Chongqing—the research team cites Shenzhen’s partnership with the Potevio New Energy and China Southern Power Grid as a winner, enabling a successful electric bus leasing effort. Hangzhou’s Kandi electric car-sharing service, modelled on the city’s effective bicycle rental business, also produced a successful trial. What isn’t working? Among other things, cities are inflating their statistics to get more preferential tax and financial treatment; local protectionism means that cities are developing regulations that serve their own electrical vehicle (EV) industry interests and prevent much-needed competition from outside the region; in some cities there is little-to-no incentive to develop the charging infrastructure necessary to support an EV market, and in others, there is too much infrastructure development. As Caixin reported in February 2014, a Potevio official stated, “Companies went crazy by building huge numbers of charging stations all at once. After reality set in, the investment interest slowed; State Grid, Southern Grid and Potevio cut investments in electric car infrastructure.” Also challenging is the decision by Chinese car makers and the utilities to develop different charging standards. 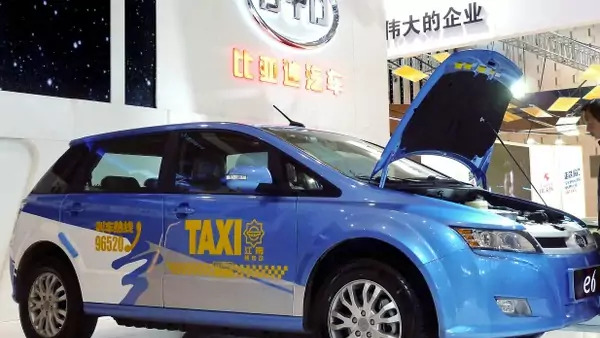 The most prominent homegrown EV car maker BYD, based in southern China, now reportedly has to develop its own charging stations in northern China. Finally, as other analysts have noted, the Chinese people are concerned about the safety of the domestic EV cars, which some domestic experts have argued have not been thoroughly tested or evaluated. Beijing is responding to these weaknesses with a raft of new regulations. The government has promised to drop pilot cities that fail to meet their targets; to ensure that new government vehicle procurement is at least 30 percent EVs; to offer subsidies to consumers based on the mileage of the EV rather than the type of EV; and, in an effort to work around local protectionism—30 percent of vehicles for sale should be from other places. Consumer subsidies will continue but will be reduced. The promise is there. Other Chinese cities can learn from Hangzhou; for the mid-to-lower end consumer, an EV car-sharing/rental market would be a huge boon. At the upper end, China now boasts a rapidly expanding middle class, as well as more than 1 million millionaires and, by some accounts, as many as 300 billionaires. These are all candidates to become individual EV owners. Beijing, along with other cities facing both enormous air pollution and traffic gridlock, could consider special HOV lanes for EVs. Given Beijing’s directive on EV government procurement, such HOV lanes would no doubt be welcomed by officials as well. Finally, Beijing could offer foreign-made EVs, such as Tesla, the same benefits of tax-exemption and avoidance of the license plate lotteries in cities such as Beijing, Shanghai, and Guangzhou that Chinese-made EVs receive. Pushing forward on green-tech cars should also be a spur to green energy; if not, much of the environmental benefit of the electric cars will be wasted considering all the coal that will be burned to provide the electricity to charge the cars’ batteries. There is no guarantee that even China’s new regulations will produce the great leap forward in electric vehicle use that Beijing desires. That decision rests in the hands of Chinese consumers. But with more and more Chinese choking on the country’s current growth model, the Chinese public may see EVs as less of a choice and more of a necessity. Full speed ahead.